Let's see if I get this right; "feminists asks man to help them declare, man is a threat to women????" 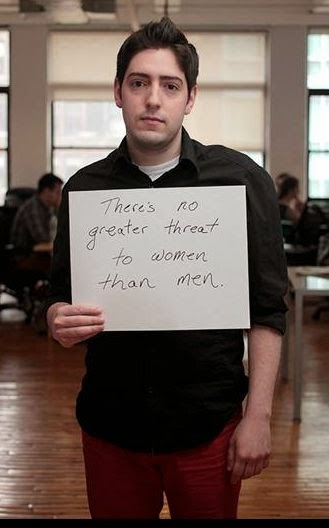 If there is no greater threat to women than men, why do they ask men for help????? Does the feminist and her mangina really believe we are just going to hand it all to them and their twisted ideals and hateful rhetoric???? Wait till these guy's are chewed up by the anti-male agenda they are supporting.I wonder if they will bang their head against a wall? Betcha they still can't get any looks from the girls.